Another musician with a global message is the subject of a film that will be shown in Cherryville Sunday. Presented by the Centre for Extraordinary Outcomes, a wellness retreat in Cherryville, the documentary I Know I’m Not Alone is directed by and stars Michael Franti of Spearhead fame. A world-renowned musician and regular of the B.C. summer festival circuit, Franti, who played the Kaslo Jazz Festival this summer, is also a human rights advocate, who in 2004, travelled to Iraq, Palestine and Israel to explore the human cost of war with a group of friends. Taking along some video cameras and his guitar, Franti documented the voices of everyday people living, creating and surviving under the harsh conditions of war and occupation. 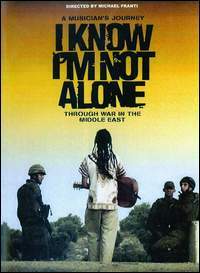 Winner of a number of international film festival awards, I Know I’m Not Alone features a compelling soundtrack, with visual and musical montages and Franti’s intimate voiceovers, which speak to the MTV, X, Y and Z generations, as well as to baby boomers, reads the film’s promotional material at www.iknowimnotalone.com.